Throughout the years, there have been more than a few drivers who have blamed their poor performance on not having enough horsepower under the hood. Engine builders have been the scapegoats for everything from poor set-ups to terrible wheelmen. Then again, it’s not very likely for Helton to struggle much. He scored his second career SAS championship in 2004 and did so in style by winning four out of seven events. In fact, he never finished outside the top five all year long is SAS competition. 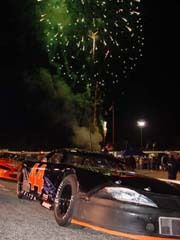 Helton also won his second career pole position for the prestigious Snowball Derby. Volunteer Performance is located in a shop behind Volunteer Chevrolet in Sevierville, Tennessee. Helton is the owner of the dealership and runs it as his day job. In the engine shop, Robbie White is the head engine builder on a total staff of three. White has been with Helton since 1996, when Volunteer Performance got their start. 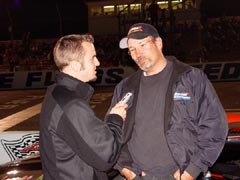 Speed51's Jeremy Troiano interviews Helton at the Snowball Derby. Ironically, the record for SES victories was recently broken by Fultz using Volunteer power. The previous record holder Anderson, who notched two championships with Helton’s engines under his hood. Helton gets the best engines. When three engines were put on the dyno before going to Kentucky Speedway last year, the Fultz engine showed five horsepower over the one of Stanley Smith. Helton’s motor had five fewer horsepower than that one. The move from the Southern All Stars to the higher profile Southeast Series is a big step, but it’s one that Helton’s team is ready to take. Helton paces the #5 of Steve Wallace. The kind of record that Helton put together last year in SAS would be next to impossible to duplicate in the SES, but he still he high hopes for the season. 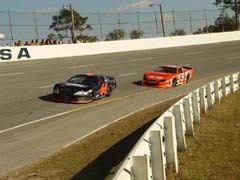 A 2005 SES schedule has yet to be released, but Helton is already planning to add a few races to his own racing schedule for the year. 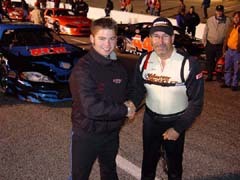 Helton (R) hangs out with Florida's Jay Middleton before the start of the '04 Snowball Derby. One place where Helton hasn’t been racing has been in Florida. He has decided not to enter Speedfest at USA International Speedway or Speedweeks at New Smyrna Speedway to instead stick to the engine building business at the busiest time of the year. Catching up isn’t easy. It takes as long as two months for Volunteer to go from an order to a finished engine. But to their customers, it’s worth the wait for one specific reason. If Gary Helton struggles at all during the upcoming NASCAR Southeast Series season, he’ll have to come up with another excuse than his motors. Helton will have powerplants from Volunteer Performance Race Engines in his #68 car as he makes the full-time move from the Southern All Stars Series to SES competition and there are a few reasons why blaming the engine builder won’t work to mask his bad runs. First of all, Volunteer horsepower helped win Jeff Fultz the SES title last year. It was also under Stanley Smith’s hood when he won at Kentucky Speedway. Wayne Anderson has beat up on the SES guys in recent seasons with Volunteer engines as well. The engines are proven to win. Secondly, Helton owns the company. He started Volunteer Performance nearly ten years ago, so the old adage of where the buck stops definitely applies to his own race team. At night, Helton, White and the rest of the team stop selling cars and building engines and get to work on their racecars. White is the crew chief for Helton’s cars. Having two roles in racing can be conflicting sometimes, but even when he is racing against his own engines, Helton keeps everything in perspective.